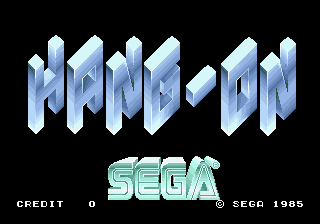 Created by legendary Sega game designer Yu Suzuki in 1985, Hang-On was a revolutionary game for its time - the quick sprite scaling arguably gave a greater sense of actually "being there" compared to driving games that had been released in arcades prior. 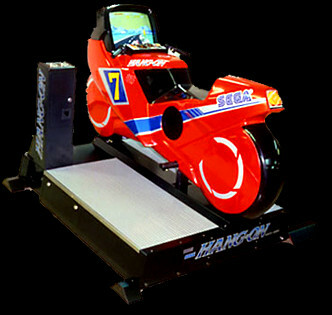 Furthermore, the game got released to arcades in three different cabinet types - a standup version, a "seated" version, and a deluxe version that simulated riding a motorcycle. The deluxe version was obviously the biggest draw to arcadegoers, but it still enjoyed a good amount of success when it was ported to the Sega Master System, and was famously included as a full playable game in the in-game "arcade" in the Dreamcast game Shenmue (also designed by Yu Suzuki). I'll be frank though - playing this game in MAME is not quite the same experience as riding that motorcycle. It's still completely and totally playable on a digital (non-analog) control scheme, but you may not have the same precise controls as the arcade handlebars. One can still do very well on this game using a keyboard, pad, or joystick... but you may have to play around a little with the analog settings. This is the second of the three qualifying rounds. If you don't like this game, or racing games in general, you still have one more chance next week to gain points to make the top 32. Good luck to everyone! lol, i see BBH LOADED A SCORE BEFORE MIDNIGHT... ha!! The game Shenmue that BBH was refering to above is also a great game. Used to test this game for Sega about 12 yrs ago. does not work in 148 either. Yeah, I had some probs too initially. Wolf106 didn't like the 1st romset I downloaded (containing 28 files like epr-6819.ic27, etc) but Wolf148 was fine. I then found another romset (containing 32 files like 6819.ROM, etc) and it plays fine on Wolf106 but not in Wolf148. Perhaps someone more knowledgeable than me can explain the differences? Will it matter which romset version I use to record the INP's? I don't think the roms themselves have changed, they just changed the filenames for the required roms inside the zip file at some point. If all the CRC's match despite the different filenames then MAME *SHOULD* run it whether it's 0.106 or 0.148. Or at least, I'm not having any issues with it. BBH wrote: I don't think the roms themselves have changed, they just changed the filenames for the required roms inside the zip file at some point. If all the CRC's match despite the different filenames then MAME *SHOULD* run it whether it's 0.106 or 0.148. Or at least, I'm not having any issues with it. I've just submitted an INP (made by Wolf106 with the "older" romset) so it can be confirmed by the judges whether its working okay. Don't want to spend hours playing if it ain't recording properly. I post my score here. If anyone cares, you can crash into the "G" in Hang-On on stage 4 to get +20sec. sikraiken wrote: If anyone cares, you can crash into the "G" in Hang-On on stage 4 to get +20sec. Will this be valid for this game in this run? Hi all, I'm tryiong to use my X360 pad but the sensitivity for steering seems to be always too high no matter what I do. Any hints?